The Wye is a contrary river, which decides what it wants to do and when, without the geography text book conventions of youthful, mature and old rivers. The wildness of the stretch below Rhayader becomes more restrained through to Llangurig. Above Llangurig and after it emerges from Plynlimon for about 10 miles ( and I never thought I would say this about the Wye) it is – boring. That might be because it obediently trickles along next to an indifferent road, and the aura of the road suppresses that of the river. It does escape from the constraining influence of the road in its emerging stages. It, and the Severn, are both born in the boggy watersheds of Plynlimon, and walk H2 takes you to the sources of both of these great rivers. So close in infancy, and then separated for so long until their final re-union at the sea. Plynlimon itself is not a scenic mountain. A.G. Bradley in his guide to the Wye called it a “lonely humpy mass” with a “dark spongy brow”. It is an important mountain though. It provides the most significant physical divide between North and South Wales and nurtures two of the most important and beautiful rivers in the southern part of Britain. It has two peaks as well – the slightly higher higher one to the west, and the more easterly one which gives birth to the Severn and the Wye. 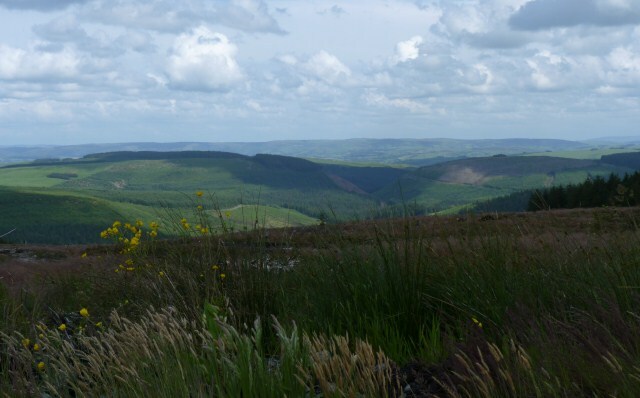 There’s an excellent site for walks near Llanidloes, with 17 downloadable walks – available in Welsh, French, Spanish, Dutch and German! Walking Britain has two good walks on Plynlimon. Plynlimon from Esteddfa Gurighttp, and Plynlimon and Nant-y-Moch Reservoir. Glyndwrs Way crosses this stretch and the Wye, and the long distance Wye Valley Walk provides some information about walking along the Rhayader to Plynlimon stretch.